FET Q4 was backwards, so it would never work. I screwed up the connections to the FET driver on the boost side, so it wouldn't drive Q4 anyway. In this configuration, it was relatively easy to make Q2 fail with all three pins shorted together, and bearing in mind that Q1 was on at this point, Q2 became a short across the power supply! The original power supply has a 10A output, so Q1 was dissipating 120W! No wonder the smoke was emitted. With the current limiter, the voltage dropped to 0 and the world was saved. What I ended up doing was taking Q4 out and replacing it with a diode, making the boost side non-synchronous. I was able to patch the diode in with some fly leads and leave the rest of the circuit the same. The ultimate circuit diagram now looks like the image labelled "After". I then turned it on and saw the attached output on my scope. The PWM is the switching input to Q4, it's noisey as I hadn't added all of the input caps. The straight line is the signal on the output terminal. 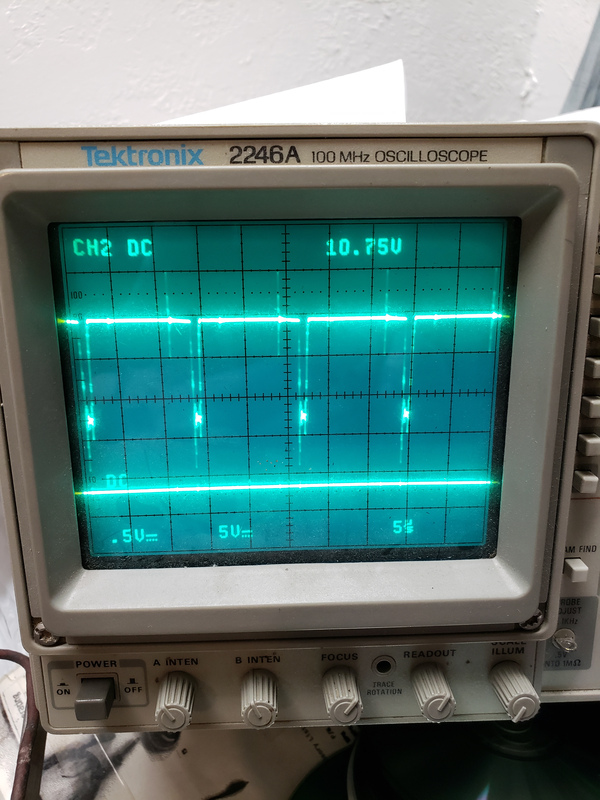 It has the letters "DC" as it is the channel I am measuring, the voltage reading is from a 10x probe that doesn't have the built in resistor that tells the 'scope it's a 10x probe, so it's displaying 0.1x the actual value, in this case, there is ~100v on that terminal. So at this point it is fundamentally working. I think it has a minimum current requirement for regulation, so I picked up some high wattage resistors and tested it. I reckon I need ~1k from +Vout to ground, otherwise the voltage takes a _really_ long time to drop due to the amount of capacitance I have on the output. I may not need all of it, but that'll require more testing in the future. So all in all, a pretty productive session. Now I will get more of the peripheral parts working so I can characterize the supply some more. I will get the serial port working first, then the ADC. I will then be able to examine how the ADC and the output voltage correlates at which point I will need to get a high wattage, variable resistor so I can then do the same with the current reading.